Decorative Life: Seed pod is used with indefinite life. The name Nelumbo is used in Sir Lanka, is an orginial Ceylonese name of the plant. The Japanese name Hasu is a version of Hachisu, which means the bee’s nest, in reference to the sack of the seeds that look to some like a bee’s nest. The specific epithet name “nucifera” means bearing nuts. 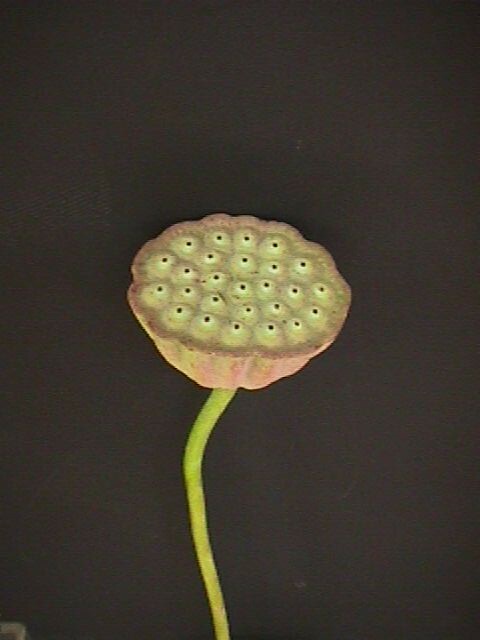 The fruit is a conical shaped pod with the seeds aranged in holes; when the seeds are ripe, they are released because the pod bends downwards to the water. This plant has reported numerous medicinal uses such as treating diarrhea, hemorrhoids, fever, insomnia, bleeding, and syphillis. It is reported that a 1,288 year old seed of this species collected from an ancient lake bed in China is one of the oldest germinable seed on record.